This painting is one of the first in the Kelly series. It depicts the Irish Sergeant Michael Kennedy who was murdered by the Kelly gang at Stringybark Creek. 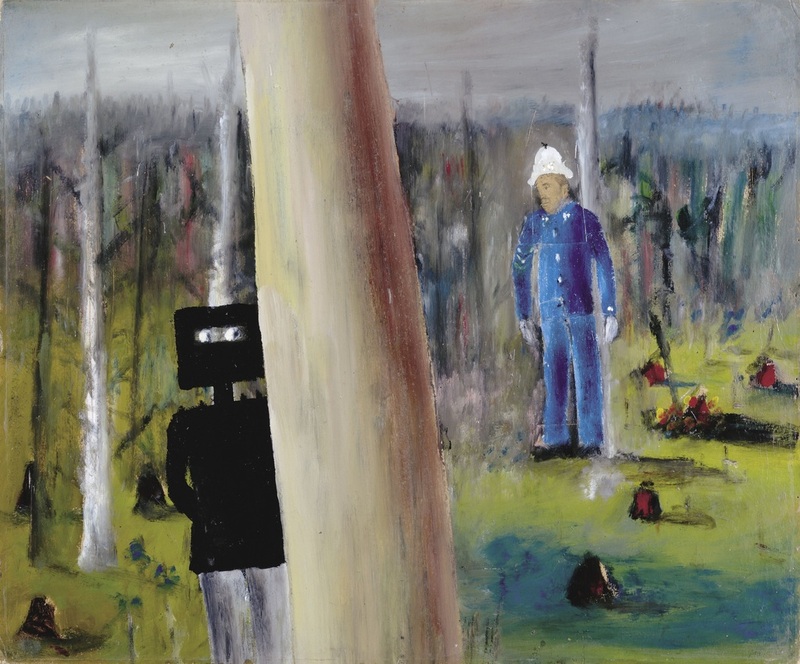 Like other early works in this series, the landscape looms large, with a tree trunk front and centre, effectively dividing the composition in two. Kelly lurks behind the tree trunk, looking sideways at Kennedy in the middle distance who appears rather like a puppet, propped against a tree with blood-red flowers scattered on the ground around him, perhaps suggestive of his fate. Here, the bushranger appears diminutive and his human frailties are emphasised, as through his helmet we see fear in Kelly’s eyes.